This species is accepted, and its native range is Nepal to China (S. Yunnan) and Indo-China. Moist evergreen lower-montane forests, sometimes on limestone. Pachycaul herbs, massive, to 1.5m, evergreen, with milky latex. Stem erect to decumbent. 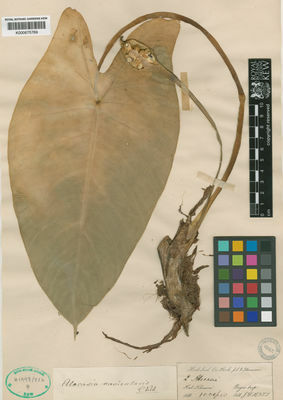 Leaves several together, clustered at tips of stems of larger plants; petiole up to 1.5m, sheath margins membranous; leaf blade peltate, cordate-ovate, ca. 130 × 120cm, apex shortly acuminate; primary lateral veins 9–12 on each side. Inflorescences 2 or 3 together among leaf bases; peduncle 40–45cm, stout, much exceeding cataphylls at anthesis. Spathe 10–20cm, constricted ca. 1/6 of way from base; proximal part green, ovoid; limb dark yellow, broadly oblonglanceolate, 18–15 × 4–8cm, cowl-like at anthesis. Spadix shorter than spathe, shortly stipitate; female zone 1–2 × ca. 1.5cm; pistil mid-green, ca. 3mm in diam. ; stigma sessile, 3- or 4lobed, lobes blunt, pale green; sterile zone equaling male zone, ivory, narrowed corresponding to spathe constriction; synandrodes whitish, stained purple, rhombic-hexagonal, ca. 2.5mm in diam. ; male zone white, cylindric, 3–4 × ca. 1.5cm; synandria rhombic-hexagonal, convex-topped due to cap-forming synconnective, ca. 1.5mm in diam. ; appendix white, narrowly conic, 3–4 × 1–2cm, equaling ca. 1/3 length of spadix, ± same thickness as male zone at base. Fruiting spathe ellipsoid, 5–11cm. Fruit ripening dark red, ellipsoid, ca. 10 × 6mm.